Raymond Engineering is currently providing services to the City of Savannah for the State Street Garage in the downtown area. The building, plagued by leaks, needed extensive repair to its enclosure and interior. 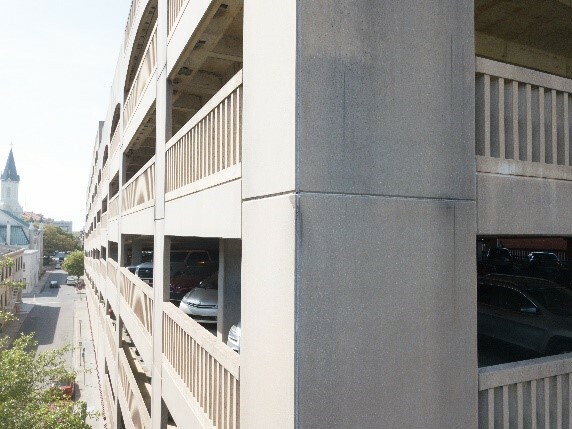 Initially, our firm provided a detailed survey to determine the repairs needed to the top parking deck and stair towers. Our visual survey revealed the necessary building envelope repairs which included; new sealants, re-coating of the parking deck surface, and minor repairs to the deck and tower roof throughout. After repairs were made to the enclosure, our team set to design the interior renovation in order to repair the extensive water damage throughout the interior spaces.